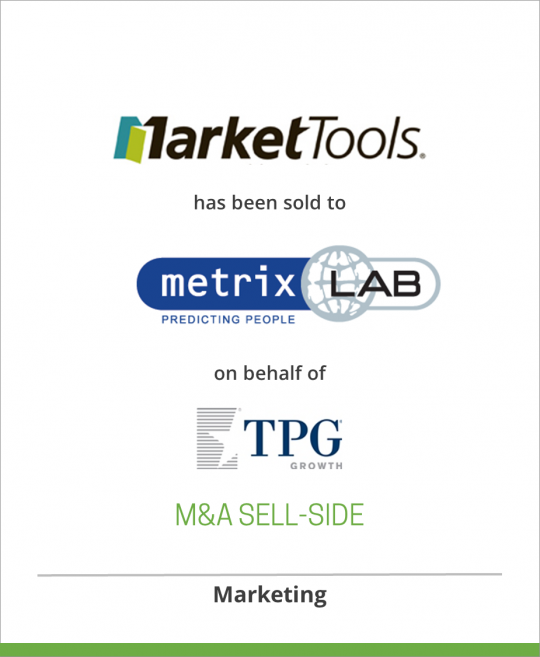 DeSilva+Phillips Investment Bankers announces that our client TPG Growth has sold MarketTools Research Solutions Inc., a leader in services and software for market research, to MetrixLab, a global provider of online consumer research services. MarketTools is known for pioneering some of the first research technologies on the Internet. MetrixLab will continue to operate MarketTools Research Solutions under the MarketTools brand name, led by its new CEO Simon Kooyman, who also serves as CEO of MetrixLab USA. Financial terms of the transaction were not disclosed. “I believe that marketers are looking for a new generation insights provider with a strong digital DNA and a global infrastructure to support them in today’s complex decision making. We can now provide our industry leading clients such as Microsoft and General Mills with truly global servicing, access to a global consumer community and advanced new research technologies in social and mobile,” said Han de Groot, CEO of MetrixLab. “I am excited that two market-leading innovators in online market research, MetrixLab and MarketTools, have joined forces. The MarketTools offering is now extended with MetrixLab solutions for digital and cross media research and customer experience management,” adds MarketTools and MetrixLab USA CEO Simon Kooyman. “MetrixLab shares the vision for helping clients uncover the consumer insights that lead to better business decisions, and shares a passion for data quality and innovation in online market research,” said Scott Arnold, outgoing president and CEO of MarketTools. As a result of the acquisition, MetrixLab employs over 400 marketing research professionals in the US, Europe and Asia, operates 13 offices worldwide and generates annual revenues of $80 million. MarketTools is the leading provider of services and software for market research. Through the use of advanced respondent engagement techniques, comprehensive analytic tools, and expert knowledge of marketing research, MarketTools helps clients innovate, optimize and execute programs that deliver high-value business impact. MarketTools research services are supported by a groundbreaking Advanced Analytics team and a suite of market research software. MarketTools is headquartered in San Francisco. MetrixLab is a fast-growing global provider of online consumer research services. Its solutions are employed by over half of the Top 100 Global Brands such as Microsoft, Philips, Google and Heineken. Headquartered in Rotterdam, with offices in New York, Seattle, London, Hamburg, Paris and Madrid, MetrixLab conducts online research in more than 50 countries worldwide.